I came to Brotzmann rather late in the game, especially as far as owning any LPs. I'd heard "Machine Gun" on KCR a few time and recall being impressed but still he wasn't really on my radar until he showed up as a member of Last Exit. In fairness, it wasn't like there was a Brotzmann section at the local store in the early 80s. But there was one at Lunch For Your Ears, the invaluable place started by Manny Maris on Prince St. in Little Italy around 1987. Probably got all my Last Exit albums there and finally decided to dip into ol' Brotz, though only for a handful on LPs before discs came along. Like I said, I'd heard "Machine Gun" several times but I have to say, never particularly warmed to it. I can appreciate its historical significance, I guess, but it doesn't do much for me. I have the anniversary issue (20th? I think) vinyl and still...it's OK but hardly tears the roof off. 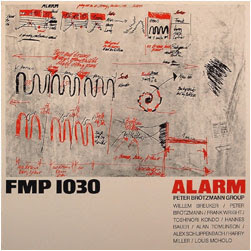 In fact, I rather prefer "Alarm", the 1981 date with Kondo, Frank Wright, Breuker, Bauer (Johannes), Tomlinson, Schlippenbach, Harry Miller & Moholo. The back of the album has a set-list of what was recorded that day, looking to be a double album's worth. Did that ever see the light of day? "Alarm" is a strong offering of its type, the solos imaginative, the whole not really that brutal. Plunk it in the middle of any random Viz Fest and it'd be the year's highlight. "Low Life" retains some of the ol' kick. 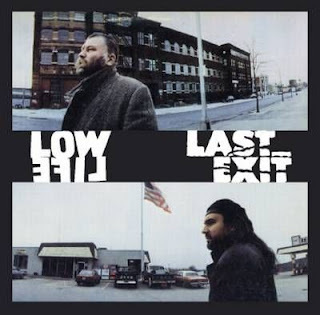 I guess the above image is from a CD reissue--no Last Exit here, just the whiter half of the group. Brotz on bass sax throughout, Laswell thwanging away in one of his better outings on a purely instrumental level. Always enjoyed Thi Linh Le's photos for the Enemy label and elsewhere, though I know little else about her (I think it's a her?). The two here, looking as though shot on a bitter winter day in some depressed area in the northeast, capture the grit of the music very well. Roger Trilling is thanked here. I went to college (Vassar) with Roger where for a time he wrote a music column for the school paper. He was a huge Mahavishnu head back then ('73-'74) and, as I'd already had my fill of fusion, I recall writing a letter, chastising him for not paying attention to the Art Ensemble, Dave Holland, McCoy Tyner (those are the names I remember citing, maybe more). I ran into him once in NYC around '77. Next time I saw his name, it was as turntablist on the first Golden Palominos record and he surfaced from time to time after that. Sometime in the 90s, he edited a "Wild Palms Reader", involving a TV show I've never seen. Anyway, how ya doin', Roger? 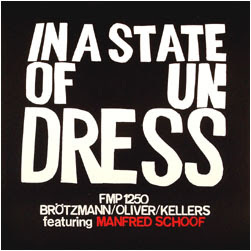 "In a State of Undress" is apparently my last Brotz vinyl. I'm pretty sure one or two are out on loan to a friend out West (the solo one with the paper airplane, for one). This one has Manfred Schoof, Jay Oliver and Willi Kellers along for the ride and is competent but nothing special. Schoof probably relaxes the atmosphere a bit. Only a few years back, I was a pretty big fan of the Brotz Tentet though it's difficult to imagine going to see them today. Caught the set at Victoriaville in 2001 that became "Stone Water", enjoying it a lot and have fond memories of a rip-roaring set at Tonic, perhaps that summer or the following. Might've been the last gasp, for this listener, of real interest in that vein of music. Walter Horn (I imagine not alone in this regard) once reviewed a Tentet performance, complaining of its overdone macho aggressiveness and, while that once, admittedly, would have carried a certain aura of excitement, it would doubtless only aggravate me today. I have a feeling Last Exit will still hit home, though, and they're plenty macho enough. Dunno, as usual, nostalgia may play into any current reaction. 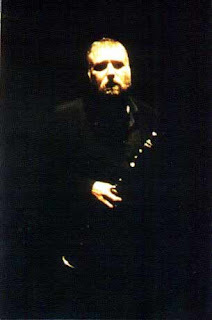 I think I last caught Herr Brotzmann at CBGBs, in a quartet that included Roy Campbell, at which point my interest had begun to wane. Tried to mail him a few months back to get some commentary on his feelings about AMM, which I've understood to be largely negative, going so far as to say that they "hated" black American music. Never received a response. Anon (PLM? I'm not making the connection), first, yep, I'm going through my vinyl, commenting on it. Been doing it for a while now and will continue for the foreseeable future. Second, it's obviously not true that I've never liked Brotzmann. I have and very much so; there are still things I continue to like as I thought I made clear above. I have some very fond memories of seeing the Tentet at Tonic around 2000. But it's more complex than that, not an either/or situation. Even at (for me) its best, the Tentet contains some problematic aspects and, yes, one of them is the macho, testosterone-fueled swagger of several of its members (not all, not McPhee, for instance). And yes, I think that generally speaking, he's operating in an area that doesn't do much for me anymore, that I find essentially sterile. But we all have our preferences. I've seen him live four or five times since that Tentet date and haven't been very moved. A certain amount of rote-ness has settled in, at least to my ears. Oh, and I do disagree about Last Exit. For a year or two I thought it was a thrilling band, in no small part due to Brotz' presence.